A few days ago I received an e-vite to my sister-in-law's (my brother's wife) baby shower. Oops! I have been putting my plans to make them a quilt on the back burner as I worked on other projects and all of a sudden . . . it was baby shower time. Since I live in San Diego and my brother and his wife live in Utah, I don't see them very often and I don't feel very in touch with their style. So I scoured their registry and her Pinterest boards and am hoping that this will work for them. 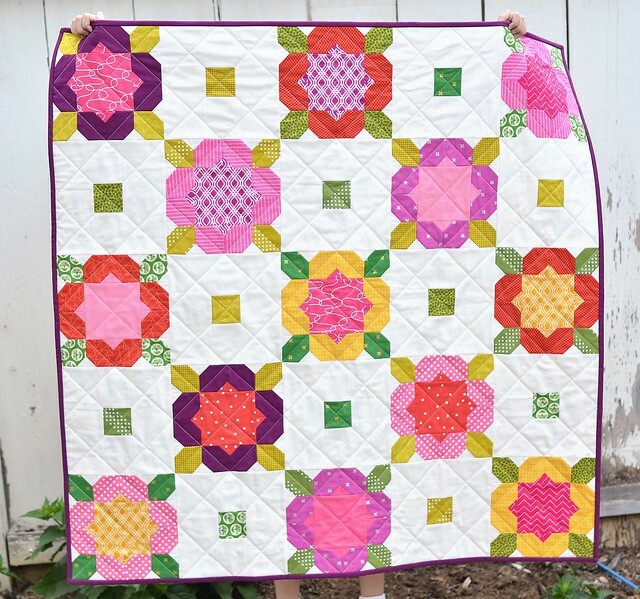 This quilt uses Camille Roskelley's Flower Girl pattern. The original pattern has 16" blocks which seemed a little overwhelming for a quilt this size, so I shrunk them down to an 8" block and added some little green squares in between. The backing is this gorgeous Carolyn Gavin print from her Petite Fleur Organic collection. I like how it is girly but it has some attitude. I feel like the quilt turned out with a Mary Engelbreit feel, which I love, and I hope she loves it too! 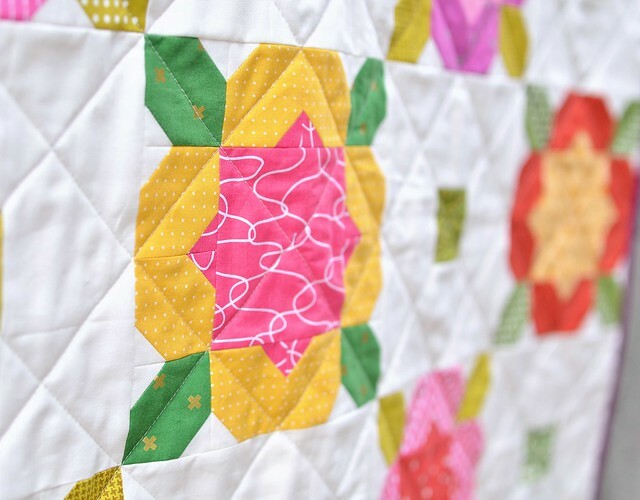 What a beautiful bright quilt!! It reminds me of a garden and is so full of life! I love your addition of the little green squares. Such a cute girl's quilt. With the spacer blocks, it kind of makes an Irish Chain. I love the fabrics you used, especially the back. I'm sure they will love it, too! Everything you make is SO GOOD. I love this! 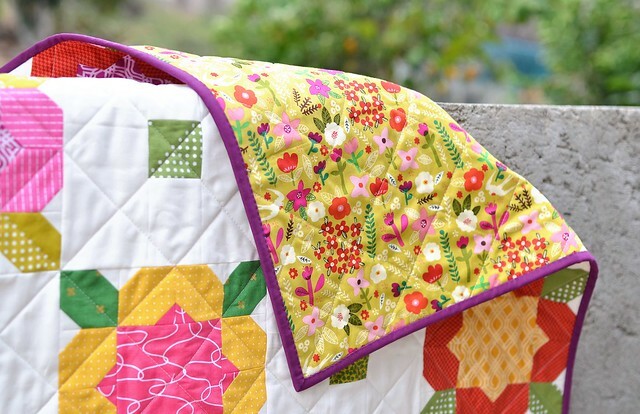 Your quilt is beautiful and is a great gift! I'm sure they will love it! Love your quilt. It really does have a M E feel to it! How could anyone not love this beautiful creation? Lucky baby! This is darling. I love how you modified the pattern. Your flowers came out really nice! It's so cute! What a wonderful gift. What a happy quilt. I think anyone would love it. Oh! 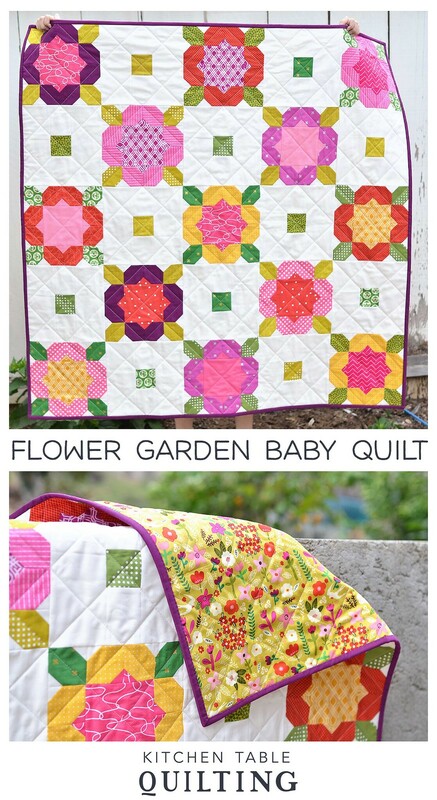 I am so in love with that quilt! Very nice job. I may just have to make one of these in a larger size. It is absolutely charming! Its beautiful. It will be loved by baby and parents. Because of YOU! I just purchased this pattern! I love the extra blocks between the flowers. I hope I can figure it out! Love your version of this quilt. I'm sure they will love it too. Fantastic quilt~I went awwwwwwwww as soon as I opened the page. I may have to by the pattern~have a lot of fat quarters to do something with. Love that you mention Mary Engelbreit~I used to do digital scrapbooking with her graphics. That's very pretty. Perfect backing too! This is probably my favorite quilt of yours so far!!! Its perfection! I really adore this quilt - so beautiful!